Here is another card that I've been wanting to try out. It's called a Double Slider. You can find the instructions at SCS HERE. I used really rust and chocolate chip cardstocks for the card base and slider backings. 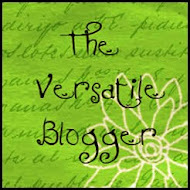 I used a retired Stampin Up DSP. I think it may have been called Outlaw? 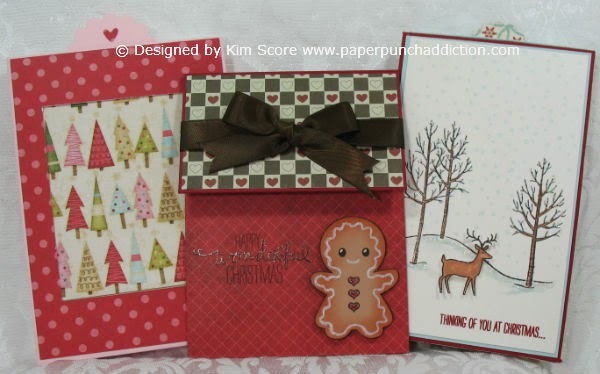 The Stampin Up greeting set I used is called FYI. The ribbon is the pumpkin pie satin with the dusty durango polka dot in the center. Notice the cute little faces on the pumpkins? 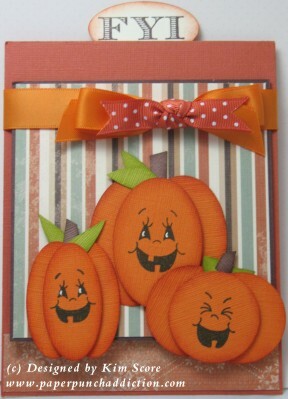 They were stamped with PK-550 Pumpkin Faces from Peachy Keen. They make all sorts of fun faces for animals, people, snowmen, etc. I'll be the first to admit that I don't draw faces very well, so I was so excited when I found these stamps! I just added a little white highlights to the eyes with a white unibal gel pen. The pumpkins are punched out of textured pumpkin pie cardstock. The largest one is 3 wide ovals, middle one is 3 large ovals and the small one is 3 of the 1 3/8" circles. Sponge the edges of pieces with really rust ink. I cut the large heart from Heart to Heart in half out of old olive cardstock to create the leaves and freehand cut the stems out of cocoa cardstock. The center section of each pumpkin is raised with a pop dot. 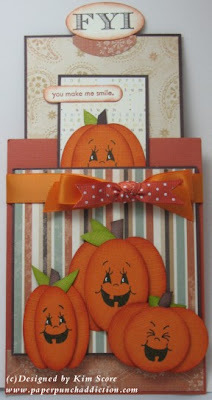 Hope you all like my little pumpkin card! This is great, Kim! Kids will love to make pumpkins. Thanks for sharing your wonderful punch art creations. This is the most awesome card!! Thank you for sharing with us-I have many of your other tutorials as well. This one put the smile on my face today. Great card, love the little faces...so cute! Thanks for this, it's great. Your card is totally AWESOME! I just love the faces from Peachy Keen! They are on my "want" list! LOL TFS! Oh my Kim...this is just SO adorable!!! You made a great find with those expressive face stamps! I bow to you oh great one!!! Love them!! I'm a pumpkin girl ya know. Love you Kimmie!! This is the cutest thing I've seen in a long time!!!! Just darling. 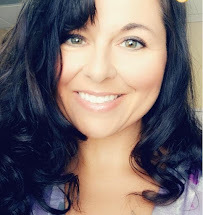 Just wanted to let you know that this post cost me a bundle! LOL I followed your link to Peachy Keen and placed a large order! I love your designs and those pumpkins are the cutest ever! TFS your work. It's very inspiring. Hugs!! Adorable! Such happy looking pumpkins. Oh my goodness! Adorable and beautifully mastered card!! This has to be one of the cutest cards I have ever ever seen!! I LOVE IT!! 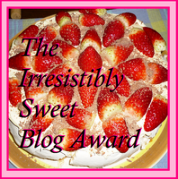 Thank you so much for sharing your talent with all of blogland!! :) Thank you too for using our face stamps and mentioning them on your blog! We really appreciate that! BEAUTIFUL JOB!! Those are the cutest little pumpkin faces I have ever seen! ADORABLE! I love these jack-o-lanterns. Amazing job! Thanks for sharing the link since I'm a new follower :).